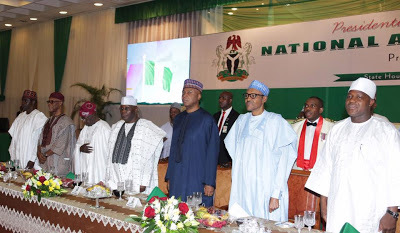 President Muhammadu Buhari on Monday promised that his administration would continue to respect the principle of separation of power as enshrined in the constitution. 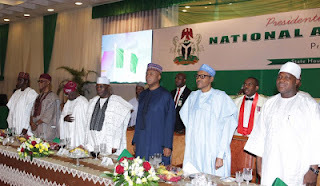 Buhari also called the attention of the lawmakers to some bills pending before them. 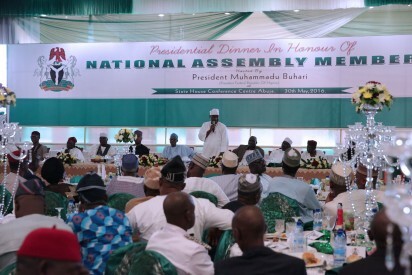 Buhari spoke at a presidential dinner he held in honour of National Assembly members at the Presidential Villa, Abuja as part of activities marking his one year in office. He urged them to give the bills accelerated consideration and passage as they approached the completion of one legislative year on June 9, 2016. The bills, according to him, include the Bills for Acts of Domestication of Agreements for avoidance of double taxation between Nigeria and South Korea, Spain and Sweden respectively; Federal Capital Territory Appropriation Bill 2016; Money Laundering (Prevention and Prohibition) Bill 2016; Mutual Legal Assistance in Criminal Matters Bill 2016; and the Statutory Budget of the Niger Delta Development Commission 2016. He added his administration had so far restricted itself to the roles of the executive provided for in the constitution and hence would not interfere in the activities of the legislature and judiciary. The President said, “I hereby restate the commitment of this administration to observe the principles of separation of powers which defines and delineates the functions and powers of each arm of government. “Thus far, we in the executive have restricted ourselves to our constitutional roles. “Therefore I, as the President, and we as the Executive arm of government, will not interfere in the functions, functioning and process of the Legislature nor the Judiciary.